Here's five less-publicized benefits of the AMEX Platinum Charge card that can be pretty useful. The new and improved AMEX Platinum Charge card comes with a host of benefits and perks to match its $1,712 annual fee. Most people would be familiar with the main highlights– $800 of travel credit, a 2 night stay at selected Banyan Tree/Mandarin Oriental Hotels, a 1 night stay at the St Regis or W Singapore, several lounge memberships, elite status with various hotel and rental car programs and so forth. However, there are some lesser-known benefits that AMEX Platinum Charge cardholders have access to. These may not get front-and-centre emphasis in the marketing materials, but they’re pretty nifty nonetheless. You may know that AMEX Platinum Charge members get complimentary Five Star status with Hertz Gold Plus Rewards. But what you may not know is that AMEX Platinum Charge members get a four hour return grace period. Why is this important? Imagine the following situation: you land at 2 p.m. but only fly off at 8 p.m. Unless you’re willing to head to the airport by 2 p.m on the day of your departure and wait 6 hours, you’re going to have to bite the bullet and pay an extra day, since most car rental companies don’t pro-rate by the hour. On the left hand side, you have the quote for a car rental at LAX airport without any code. 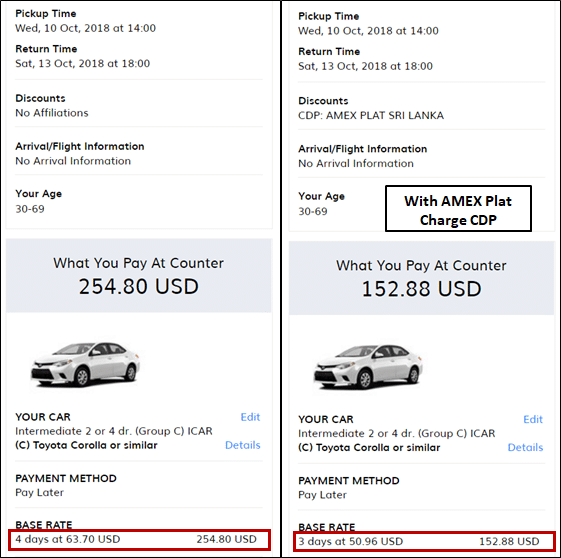 You’ll see that even though I’m picking up the car on 10 October and returning it on 13 October, I’m still charged for 4 days because my return time on 13 October is 4 hours after the pick up time on 10 Oct.
On the right hand side, you see what happens when you use the AMEX Plat Charge CDP. I have exactly the same dates and pick up times, but I’m now only being charged for 3 days. Not only that, my base rate has been discounted by 20%. If you’re a driver in Singapore, you’re probably paying anywhere from $80-110 per year for an AAS membership. 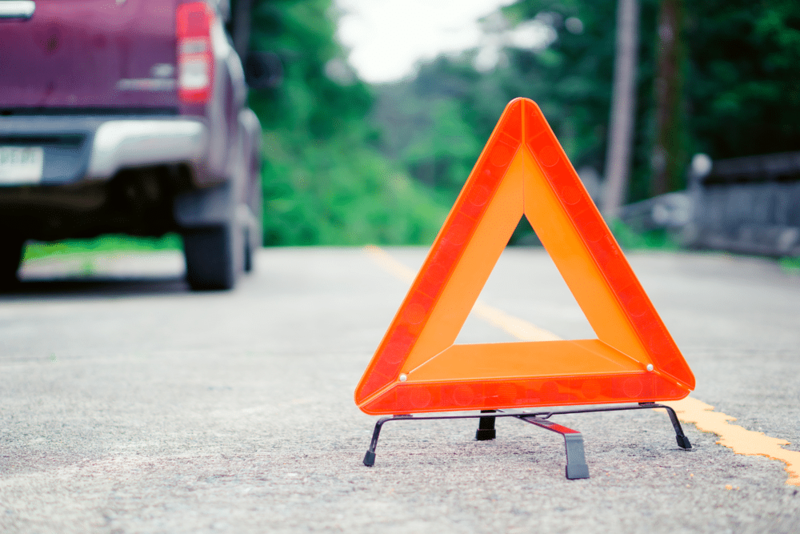 The maximum payable for roadside assistance is capped at S$400 per case, and this is capped at two towing or roadside repairs per year. Your vehicle can only be a maximum of 3 years old- so obviously after that you’re going to want to get regular AAS coverage. To my knowledge, the only other card offering a similar benefit is the UOB Visa Infinite Metal card, and their roadside assistance is capped at two incidents per year. They also do not cover the cost of alternative transport. I wrote a recent post reviewing complimentary travel insurance offered by credit cards. My conclusion was that most of these policies did not provide sufficient coverage to be your primary form of protection. You’ll note that the AMEX Platinum Charge policy has higher coverage for medical expenses, trip curtailment and personal belongings, while the HSBC Visa Infinite has higher coverage for accidental death & TPD and baggage loss, while providing cover for rental car excess and personal liability. The aggregate coverage limits for flight and luggage delays are higher for the HSBC Visa Infinite, but it’s important to note that their definitions are stricter. For example, the AMEX Platinum Charge’s insurance pays you $400 per person ($800 max) once your flight is delayed by 4 hours. With the HSBC Visa Infinite, you get $100 per person per every 8 hours of delay ($1,000 max). A final important point to note for miles chasers: HSBC Visa Infinite travel insurance is underwritten by AXA, which explicitly excludes coverage for award tickets and stays. The AMEX Platinum Charge travel insurance is underwritten by Chubb and covers such things. This is especially important if you’ve booked an award ticket under KrisFlyer’s Spontaneous Escapes promotions, as those are strictly non-refundable. Items purchased with your AMEX Platinum Charge card qualify for purchase, refund and extended warranty protection. Purchase protection: If within 90 days the item you purchase is stolen or damaged, you’re covered for the replacement or repair cost up to $10,000 per incident. There are some exclusions to this policy (eg you’ll need to pay 10% of the claim amount yourself, and this coverage doesn’t include items left unattended in a public place), but all things considered, the knowledge you’re protected if you accidentally drop your brand new iPhone XR provides one heck of a peace of mind. Refund protection: If you buy an item and want to return it within 90 days for whatever reason but can’t, you’re covered up to $1,000 per item. For this coverage to be effective, the item must be in a new and saleable condition, free from all defects and in full working order. Also note that the policy does not apply to the following: jewellery; precious stones; rare and precious coins or stamps; one-of-a-kind items including antiques, art work and furs, cash or its equivalents, travellers cheques, tickets or negotiable instruments; services, mobile phones and their accessories, recorded media (including but not limited to CD’s, DVD’s, computer software, video and audio tapes); books; animals and living plants; consumable and perishable goods; healthcare items; used, rebuilt and refurbished items; closing down sale items; vehicles and their parts. Extended warranty: If you purchase an item that costs less than $10,000, and said item stops working within a 24 month period (or twice the original manufacturer’s warranty, whichever is shorter), you’ll be covered for the cost of repairs and replacement. In the AMEX publicity materials, the Fine Hotels and Resorts (FHR) program gets all the limelight. This leads some card members to assume that unless they’re willing to stay in an uberluxe hotel, there’s nothing of value for them here. These aren’t going to provide you with Capella levels of luxury, sure, but they’re still very high quality places to stay and much more realistic options for most people. Couple that with the hotel credit and space-available room upgrade, and you’ve got a good deal on your hands. There is a website where you can see the properties on offer, but booking via the website is only for US-based cardholders to book. 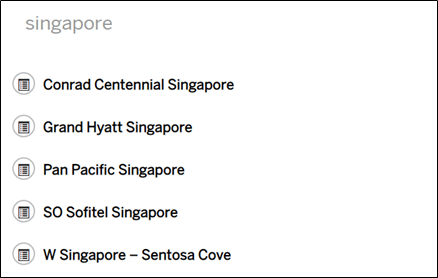 Singapore-issued Platinum card holders have to call up the Platinum concierge to secure these bookings. None of these benefits, in and of themselves, will probably be sufficient to get someone to pull the trigger on an application. However, if you’re on the fence or have recently decided to get on the AMEX Platinum Charge bandwagon, these are useful benefits to be aware of. I should be getting my card early next week, and will be taking some very unglam unboxing photos when that happens. Don’t think your ‘dropping your iPhone XR’ example is a good one as mobile phones are excluded from this policy. Just did my first hotel collection stay at a Hilton property. Im not sure if my room was upgraded (I didn’t care that much since this was more of a regional hotel, so not much to upgrade to) but I did get the usd75 credit from hotel collection as well as the free breakfast as Hilton gold, so the benefits stacked for me. How does Osteria Francescana fit into this? Extended warranty against you not being happy with your burrata..? extended warranty.. only applicable to items above $150 and note depreciation of payout per year. basically you wont get 100% warranty throughout the extended warranty. Do you know if the travel credits and vouchers can be used by the supplementary card holder instead of the main card holder? This is the 4th dedicated article about the Amex Plat Charge card in recent times. And Aaron has not even receive the card yet. Bias or not, it does feel touch too much attention paid to Amex. Well, it’s shiny and expensive. Haha. Hi Aaron, regarding the complimentary Travel Insurance, if we are claiming our miles for travel (hence not using the Platinum charge card to make payment), how does this benefit gets ‘activated’? The Hertz CDP code 1631611 doesn’t grant even 1 extra hour in Australia. Maybe this is only for US ?